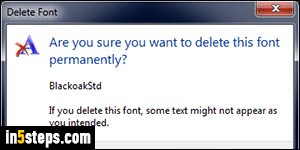 Just like you can add third-party fonts to Windows, you can uninstall them when you no longer need them. 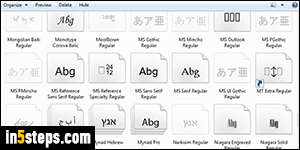 In graphic design work, where you often have to load and unload fonts for different project, a font manager is best. Each client uses specific fonts for branding, and depending on license, you can use the font in one context, but not in another. Especially for commercial projects, make sure that you are using a legally licensed font. My favorite source is MyFonts.com. But, for normal use, it's easier to manually install / uninstall your fonts. 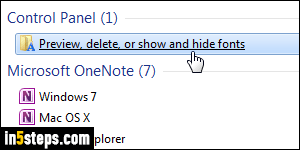 First, open the start menu and type "remove font" in the search field: then, click on the "Preview, delete, or show and hide fonts" listed under Control Panel. This opens your system Fonts folder, located at "C:\Windows\Fonts". Unlike "normal" folders, this one opens in the Control Panel, not Windows Explorer. This folder shows all fonts currently installed on your system: the ones that display a stack icon are fonts that ship in multiple variants (like Microsoft's own Arial, which includes a Black (very bold) and Narrow variations). 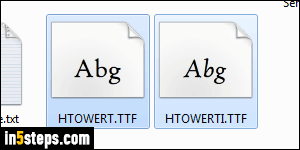 Before you uninstall a font, which can't be undone except possibly through a painful system restore, know that you can backup your font to another folder, just like you can with a regular file: see "Copy fonts from one PC to another" for details. 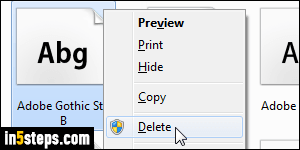 When the Delete Font dialog opens ("Are you sure you want to delete this font permanently? ... some text might not appear as you intended"), click Yes to remove the font. Windows is referring to a process called "font substitution": when text is created for a font not installed on the reader's PC, the program will choose itself a replacement font. Microsoft Word and PDF deal with this by (optionally) embedding fonts into the file - but most programs don't do that.